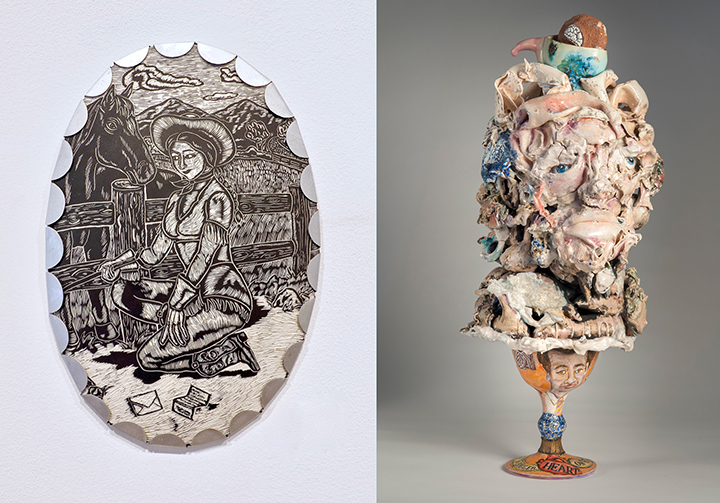 A ceramics-based exhibition titled SHE SAID, HE SAID, by Boston artist Kathy King and New York artist Matt Nolen. The show is curated by Ben Krupka, faculty in the arts at Simon's Rock. SHE SAID, HE SAID opens January 28, 2019 and will be on view daily until March 8, 2019 in the Hillman-Jackson Gallery, located in the Daniel Arts Center. SHE SAID, HE SAID focuses on narratives embedded in the medium of ceramics, by artists Kathy King and Matt Nolen, friends and colleagues for over 20 years. King’s cameo-like wall reliefs allude to traditional jewelry and portraiture, combining ceramic and metalwork in sculpture resembling woodcut prints. Each piece presents a tongue-in-cheek vignette exploring histories of gender and sexuality, using humor and pop references as entry points into broader topics such as love and life as a woman. Similar to King, Nolen’s figures reshape traditional art historical canons, combining aesthetics of classical busts and antiquated vases with dreamlike prints. The work explores fluctuations between psychological dichotomies such as frailty and resilience, failure and triumph in convoluted compositions representing the perpetually transitioning internal landscapes of the self. For both artists, narrative lies at the core of their practice, told with the physical and historical properties of ceramics, and forms the crossroads where their work intersects.